I used to live in an apartment complex with 980 units, all of which were outputting some electrical noise. This made copy on the low bands very hard. A small receiving loop helped; it has very deep nulls and made listening on 80 and 160 more pleasant. An update on the story is warranted, since I wrote this page a long time ago but this page has become fairly popular since. I built this loop because of a particular totally crippling noise that wiped out signals on my doublet on 80m and 160m. After a few months of very successfully using this loop and moving it around the living room slightly, I realized that I was pointing the nulls in slightly different directions depending on where it was in the room! If you ever have done radio direction finding with a loop like this, you might recognize that moving a few feet to the side and having to adjust the null direction means that you're getting very close to the source. It's straightforward triangulation. If the source is far away, you have to move a huge distance before you really have to point in another direction. The conclusion? As they say in those dumb ham radio horror movies (they have those, right? ), the source was coming from inside the house. As it turned out, it was my desktop computer in the workshop/office room. I didn't really use that while I was operating, so I just turned it off. But, I suppose if it hadn't been my computer, the story would have ended differently, and the loop really did a good job nulling out my own computer. 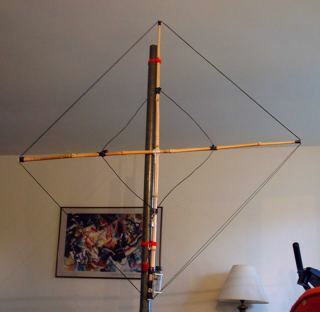 The receiving loop goes on a tripod in the living room. The loop is 3 feet square. It's two turns of #20 insulated wire on a bamboo frame, resonated with a 0-300pF capacitor for 80m (needs 150pF or something, I think), with a 500pF fixed cap with alligator clips for 160m. (550pF required, total. You can see the 500pF cap dangling from the velcro straps in the picture. The antenna is currently set up for 80m.) I measured the inductance of the loop with my MFJ analyzer, then picked the resonating caps. 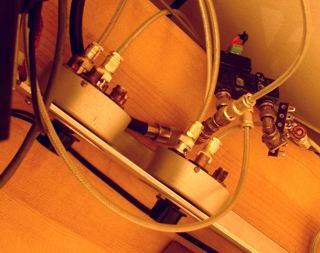 Coupling to the loop is done by a 16" square loop that connects to coax. Click the schematic for a larger version. 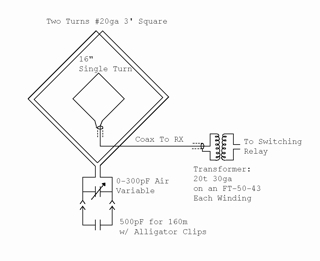 The other end of the coax has a 1:1 isolation transformer to isolate the coax shield from the rest of the grounds. I think this is not at all necessary, but it's there for an eventual try at a low noise receiving inverted L that is transformer coupled and has a separate ground. 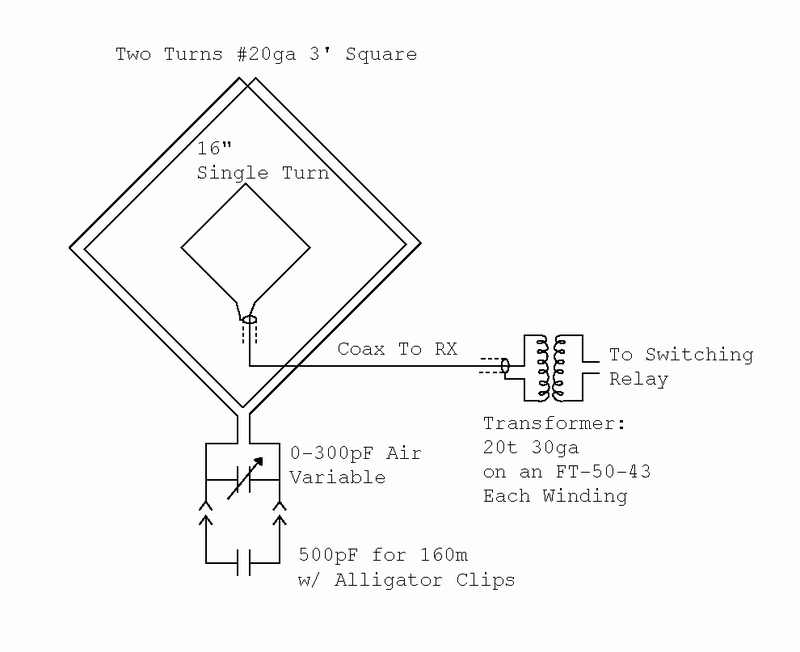 This goes into a changeover relay that is currently footswitch operated but will eventually be operated by the TX GND on the FT-857 and/or its cousin on the TS-440S. You can't transmit into this antenna; the relay lets me stomp a switch and go into transmit. Here's the RX loop / main antenna T/R relay (black) and some coax switches. I've found that this loop needed to be in the middle of the living room for proper nulling. This put it about 10 feet from the radio. Now, it needed frequent adjustment for resonant frequency and null direction, so I needed to be able to see the radio's S-meter from across the room. I found that the MTR setting for the backlight color on the FT-857 is useful for this; the backlight changes from blue through purple to red as signals get stronger; this plus audio lets me peak the tuning and find the deepest null from too far away to see the meter box. I've since moved out of the apartment and even before I did, I pretty much stopped using the loop. Cleaning up my own devices was sufficient to make many of my noise problems go away. But if the noisy computer was my neighbor's computer instead of mine, the loop probably would have been a permanent requirement in my apartment station. I do still use it from time to time for direction finding. I tracked some noise at my new house to the elevators in an apartment building near here. I can just imagine if I'd been living IN that building. I would have to put up with this sound at 59+40dB. Sometimes you need all the help you can get.